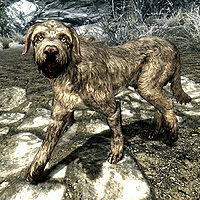 Barbas is a large gray hunting dog found along the road outside Falkreath. He is Clavicus Vile's companion, a supernatural creature that usually takes the form of a dog. Barbas cannot be harmed during the course of gameplay, except by the Rueful Axe. For more information on Barbas, see the lore article. 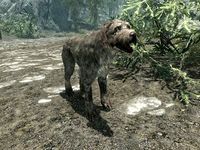 Once you have reached level 10, a visit to Falkreath will net you an encounter with a guard asking questions about a dog you may have seen in the wilderness. He's quite cryptic about what kind of dog but will point you towards town blacksmith Lod with the words: "The blacksmith is offering a reward for a dog he saw on the road. I was hoping you'd seen it. I guess I'll stay on the lookout. Keep your nose clean while you're here outsider." Locate Lod near his forge between 8am and 8pm and he will greet you with: "Did you see a hound on the road? A fine, strong creature that's been wandering near town." Depending on which of the three options you choose, Lod will reveal that he is a bit lonely and could use some company: "I asked the gate guards to look for him. I can't afford to chase him down but could use a fierce, loyal beast to keep me company. ", "No, no, this one's alone on the road outside of town. I can't afford to chase him down but I could use a fierce, loyal beast to keep me company." or "There's one out on the road. I can't afford to chase him down but I could use a fierce, loyal beast to keep me company." He will end the request with: "If you were willing to retrieve him for me I'd give you some fresh meat to attract him out on the road." He will then hand you some fresh meat to lure the dog to you. A map marker will point you to the correct spot, specifically the road southwest of Falkreath. When you hit the correct spot, a stray dog will come rushing towards you, obviously eager to get hold of the meat. Instead, the dog starts talking to you: "You are exactly what I was looking for." He will then bark normally and you will have two options. If you ask him to confirm he was looking for you he will respond: "Yes, I think you'll be just what I need." If you ask him if he just talked he will say: "Skyrim is now host to giant, flying lizards and two-legged cat-men... and you're surprised by me? Yes. I just talked. And am continuing to do so." Both options will lead to the dog elaborating: "You see, my name is Barbas. And I have a problem I think you can help sort out." If you tell him you are busy he will say: "I know, I know... Wars to fight, dragons to confront, guild business to conduct. Listen, when you're ready to do something useful, find me outside Haemar's Shame, in Falkreath." This will make him wander off and wait for you near Haemar's Shame. By choosing the other option, specifically what he needs help with, he will elaborate more on the task at hand: "My master and I had a bit of a falling out. We got into an argument and it got rather... heated. He's kicked me out until I find someone who can settle our disagreement. That's where you come in." If you choose to mock the dog and tell him he is a lost little puppy, he will tell you who he really is: "Very funny. My master is Clavicus Vile, Daedric prince of wishes. As you can imagine, he's quite the important person." If you then respond with 'sounds easy enough' he will say: "Thank you. Now, since he banished me, Vile's been rather weak. He can't manifest very far from one of his shrines. I know there's a cult that worships him at Haemar's Shame. We should be able to talk to him there. If this works out, I'll make sure you're rewarded. Just don't trust any offer he makes you... okay?" The quest will now start and Barbas will be off to Haemar's Shame. You can either travel with him or fast-travel there; he will get there sooner or later. Even if Barbas told you he'd meet you outside, he will actually already be far into the cave, so just enter and fight your way through. If you took the long trip with Barbas to Haemar's Shame you will have fought an awful lot of enemies with Barbas' help. If you fast-traveled there, you will find Barbas in the inner depths of the cavern, at the foot of the Shrine of Clavicus Vile, busy killing the last of the vampire worshippers that inhabit the cave. Ugh. That insufferable pup? Forget it. Request denied. No deal. I'm glad to be rid of him. Even if it does mean I'm stuck in this pitiful shrine, in the back end of... nowhere. Well... perhaps there is a way he could earn his place back at my side. Maybe. But no promises. As much as I hate to say it, you're almost as powerful as I am right now. But that's just because half of my power resides in that mutt, Barbas. Come to think of it, I know of a win-win situation for both of us. There's an axe. An incredibly powerful axe. An axe powerful enough for me to have quite a bit of fun, indeed. If you bring it to me, I'll grant you my boon. No strings attached. No messy surprises. At least, not for you. As I recall, it's resting in Rimerock Burrow. Barbas can lead you right to it. The little mutt might even earn his place back at my side. With these words, Clavicus will be quiet and Barbas will come rushing up to you. He will now act as your follower and you can ask him about the axe: "One of Clavicus's little jests. A wizard named Sebastian Lort had a daughter who worshiped Hircine. When the daughter became a werewolf it drove Sebastian over the edge. He couldn't stand to see his little girl take on such a bestial form. The wizard wished for the ability to end his daughter's curse. Clavicus gave him an axe." You can now ask Barbas to stop following you and vice versa, but he will prove a good companion so bring him along, despite his constant barking. 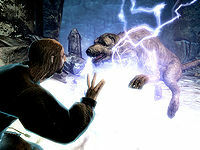 Once you get to Rimerock Burrow, Barbas will help you against the powerful wizard Sebastian Lort and will, due to his essential status, prove an impossible opponent even against Sebastian's atronach companion and his leveled Conjuration spells. Once Sebastian is defeated, claim The Rueful Axe from the altar. At this point you can tell Barbas that you want to keep the axe for yourself and he will advise you: "The axe isn't the only item dear old Clavicus has. Give him the Rueful Axe and once we're reunited the Masque of Clavicus Vile will be yours." Return to the Shrine with the axe and Barbas and be prepared to make a choice. When you approach the Shrine again Clavicus Vile will say: "Ah, you've got the axe! And my dog. Splendid." When you ask him to fulfill his end of the bargain, he will make you an offer: "Excellent work. A hero and his faithful companion, retrieving the ancient artifact for the prince. It's almost... storybook. Ah, but it almost seems a shame to give a weapon like that away, doesn't it? I suppose I could be persuaded to let you keep it... But only if you use the axe to kill Barbas. Simple as that." Meanwhile, Barbas will say, "Wait a second, there's another option here." and if he is asked, will tell you of another reward if you give the axe instead. "I sure would like to keep the axe…"
And I could absorb the spirit of poor, dead Barbas. He'd still be reunited with me. And I'm sure Barbas doesn't want me to have that axe. He'd want it this way. The choice is yours, friend. We're all counting on you to make the right decision. Put him out of our misery! "He's dead. Are we done here?" "No deal. Take the axe and take back Barbas"
Hrmph. You're no fun at all. Guess I'll have to make my own fun elsewhere. And with the pup back, I'll be restored to my full power. There's a whole world just waiting for me! Barbas is voiced by Stephen Russell. Barbas can be a useful follower to have in a fight. His bite is strong enough to kill many weaker enemies in one strike, and he's an effective decoy against more powerful enemies. Barbas is not just unkillable: he is "Invulnerable", so he cannot be harmed at all and won't "kneel" like characters that are merely essential. Barbas barks at more frequent intervals than other dogs and is set to maintain a very close proximity to you. If you attempt to stop, he will almost certainly shove into you, interfering with many basic actions. If you are sent to Haemar's Shame on a radiant quest after finishing A Daedra's Best Friend, Barbas may still be in the final chamber and may help you fight the respawned vampires. Any Vigilants of Stendarr, who are pledged to battle all Daedric influence, may attack Barbas on sight. It is possible to have Barbas as a follower along with another creature follower. 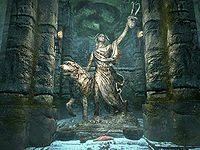 Even after A Daedra's Best Friend is completed, the game may still show Barbas as a creature follower. This would prevent you from getting another creature follower. This can be fixed by executing the set playeranimalcount to 0 command at the console. 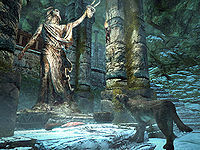 Barbas may attack Dremora that are summoned by you. ? The statue will disappear after finishing the quest and Barbas will still be in the room. Player: "Why did Vile kick you out?" Barbas: "Well... I guess you could say I got on his nerves. I tend to be the voice of reason and he finds that... irksome. He couldn't just kill me, you see. We're technically part of each other. But he was able to banish me from his domain. Of course, because of our separation, Vile is now much weaker. I guess he figured it was a small price to pay for not having to listen to me anymore." "Vile! None of that - you made a deal, and the mortal stood by it honestly. Now it's your turn to come through." "We should go get the axe." "Let's get the axe and be done with this." "Now that guy was nuts." "Don't bother, Clavicus won't talk to me." "I have a feeling I'm not going to like what happens when we get back to Clavicus." "All this just to kill me Clavicus?" "Well, well. Hello there, big man." This page was last modified on 23 October 2018, at 10:42.